Since I went to bed at 9pm the night before, I figured there was no way on earth I would sleep all the way until my alarm went off at 6:30am (9 hours of sleep! Unheard of for me lately)… but I did, and it was glorious. I definitely felt all carbed up, but in spite of getting all that sleep, not quite well rested. Less than a week until Caffeine-Free October is done! I can’t wait to start the NYC Marathon with a big cup of coffee first thing. Luckily, the race started pretty late. Although I had to catch the bus from the Ontario between 7:30am and 8am, I’d then have a ~30 minute bus ride (plus a stop at customs to show my passport one more time) on which to wake up before reaching the start. And, since the race organizers plan ahead for any customs delays, the race itself wouldn’t actually start until 10am – which meant plenty of time to relax and read a few magazines before I actually needed to start running. If you’re a late riser, this is a great race for you to do well! Unlike previous years, where I’ve typically befriended other runners in the art gallery, I mostly kept to myself. Instead, I passed the time by reading a few magazines I brought with me – Time Out New York, 5280, Runner’s World, and Women’s Health. I have a huge stack of magazines in my apartment that I really need to start reading more often so I can toss them! 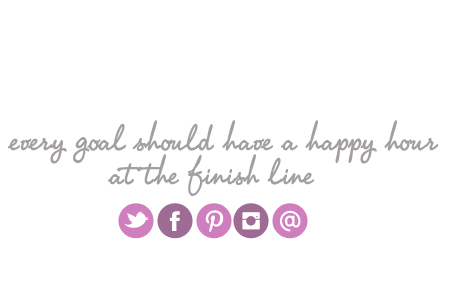 I’ve been trying to reduce clutter, and one thing that I really like doing is just pinning articles/products/events I find in magazines to my Pinterest boards – definitely cuts down on the paper in my apartment. Before I knew it, it was time to check my bag and then head for the start about a block away. (I don’t usually check a bag, but since you have to bring your passport/visa/etc to the start, most runners check a bag with it rather than carrying it on the run.) I had a moment of uncertainty when I debated whether to just keep wearing my white fleece (it was cold!) or whether to check it. It can always be hard to remember, and I never want to believe it, but if you’re slightly cold at the start, that’s actually good. The typical rule of thumb is to dress as if it’s 20 degrees (F) warmer than it is, because running will heat your body up enough to make up the difference. But I am not very god at figuring out what’s appropriate to wear in what weather. Lately, I’ve become so accustomed to Dallas weather that I spent yesterday (when the high was 80 degrees) ordering soup for lunch and drinking hot cocoa in the office! I sucked it up, though, putting my fleece into my checked bag, and then finally leaving the warmth of the bag check schoolbus with just a few minutes before the official start. Before heading to the start line, though, I decided to quickly hit the portapotties – and ran into kind of a funny situation. The portapotties were on a grassy field, but since it had rained all night (hallelujah for no rain during the race! ), the field was a bit muddy. As a result, when I stepped into the first portapotty, there was mud in a thick layer all over the floor. I honestly thought someone had an “accident” in the portapotty, and quickly shut the door to that one. But when the next one was the same, it dawned on me that it was just mud. Ha! Joke was on me there. I arrived at the start just as the (American) National Anthem was playing, missing O Canada! entirely. But that was fine – it meant less time standing around waiting for the race to start! My Garmin located its satellites quickly, and then we were off and running down the streets of Buffalo. I was immediately glad that I had left my fleece behind, since I was perfectly comfortable once I had actually started running. What I had kept, though, were a pair of cheap fleece gloves I had picked up at a dollar store ($0.96 with the exchange rate!) that were keeping my hands super warm. My shirt sleeve already had thumbholes so that my palms would be warm, but it was nice to have my fingers toasty as well. 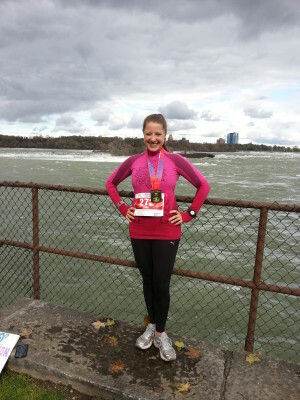 Overall, I was pretty happy with how this outfit worked for the race – perfect for the weather! But what I had forgotten, unfortunately, were Gus. I realized this the night before the race, but the race promised candy every 5 miles, so I figured that would be enough to get me through. However, when we came to the first water station at mile 1, I made sure to get Cytomax instead of just plain water – I needed all the extra calories I could get! The course wound through the streets of Buffalo for the first few miles, and while I was clocking sub-9 minute miles, my legs definitely felt heavy. I wasn’t concerned, but I filed that away as a data point that I probably wouldn’t run the race very fast, and also that if I did want to do well in a race, I probably shouldn’t do a Flywheel double three days beforehand (fun as it may be). But today wasn’t at all about going fast – I just wanted to finish the race with enough time to catch my 5:45pm flight (a legitimate factor since the race didn’t start till 10am), and more importantly, injury-free. One week till NYCM!!! That thought kept going through my mind so many times during the race. 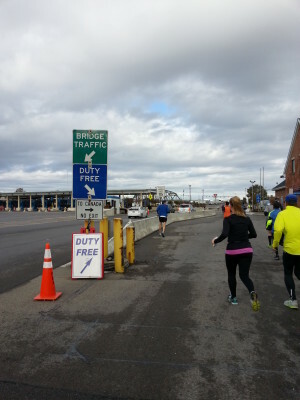 The slight uphill as we ascended the bridge was honestly the only hill of the race – and it really wasn’t bad at all. I was just so excited to be crossing the border – what a neat experience! At the center of the bridge was a flagpole with a US flag on one side and a Canadian flag on the other – I stopped for a quick pic of the flags and to capture the beautiful day. 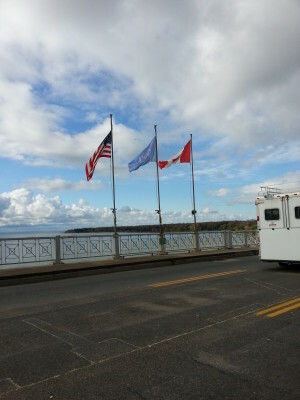 As you could probably tell by the flags in that picture, the Peace Bridge was definitely pretty windy – but that was just the beginning of the wind. Once we reached the end of the out and back, miles 7-25 were all along the Niagara River, and we would face a headwind the whole way. Although I had taken my gloves off at mile 6 because my hands were getting hot and sweaty, I put them back on after coming out along the river… and kept them on for the rest of the race. When I reached the halfway point, I was very pleased to discover that I had been running pretty steady 9:10-ish splits so far – because I hit the 13.1 chip mat in 2:01. My typical MO is to positive split my marathons and run the second half about 5-10 minutes slower than the first, but that would still give me a totally respectable 4:06-4:11 finish, which I’d be thrilled with. Given how dead my legs had felt at the beginning, I’d be really proud of that kind of finish! But as the miles ticked by, I kept maintaining around a 9:10 pace. I had started out the race hoping that I’d run around a 4:22 (ten minute miles), and I had by now figured out that I was feeling strong enough that a ten minute mile pace would be my “I’m slow and giving up now” pace. With that in mind, I readjusted my finish goal to be 4:12 (2:01 first half + 2:11 second half if I kept ten minute miles), and then every time I passed a mile marker at a nine minute pace, I subtracted a minute from that goal time. As I started getting closer and closer to the end of the race, my predicted finish was dropping from 4:11, to 4:10, to 4:09… and all the way down to 4:05. Wow! 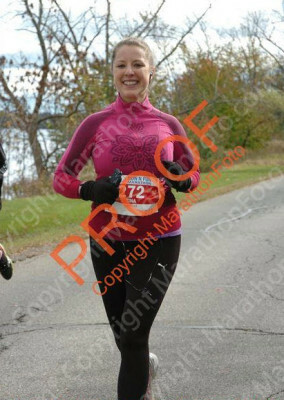 Perhaps I was going to finish this race even faster than I had done Hartford two weeks earlier? Around mile 18, I was definitely starting to get tired – and was very grateful for an aid station that had jelly beans instead of jujubes. Much easier to swallow! (On the candy front, the mile 10 aid station also had chocolates, which was pretty neat.) I stopped for a while at the jelly bean aid station to glom down as many as possible – and while a lot of people passed me while I was stopped, I quickly passed them back once I got going again. In general, I was pleasantly surprised that my steady pace seemed to be slightly faster than just about everyone else out there… although it also seemed kind of strange to me. Everyone in my vicinity was on track for a sub-4:15 finish, even if they slowed down considerably, and I was surprised that more weren’t speeding up (to negative split) instead of slowing down (to positive split). I think this was probably the marathon where I passed the most people in the last ten miles – and I wasn’t even really negative splitting! When I got to mile 20, I knew that I could do a ten minute per mile pace and still finish in an hour – which was really comforting. So close to having my 99th marathon done! My excitement kept mounting as I got closer to the finish, since the fewer miles I had less, the smaller my chance of injury or incident was. While I was running faster than planned/expected, I definitely wasn’t on track for a PR (almost 15 minutes slower than that! ), and my primary goal was just to finish. But as the miles ticked down, it became clear that my time was going to be even faster than just finishing. I now started to worry that the predicted finish time I had sent my mom (4:05-4:10) at the halfway point was now going to be much slower than what I was actually going to run (around 4:03? 4:02?). My mom is super social when she comes to my races, and there has been more than one occasion where she’s missed seeing me because she was busy making friends around her :) Now, when I do races where she’s spectating, I try to give her a window of time when I’ll be finishing so that she knows when to focus on looking for me – but it seemed like my window was going to be off this time. I wasn’t going to slow down though – I felt so fantastic! After hitting mile 24, I had a huge smile on my face – and I switched from podcasts to music to make myself feel extra inspired and energized. My stride felt incredibly smooth, and it was here that I really knew I was going to make it to the end without incident. No injuries, no weak legs – just a smooth, strong run that made me feel like I was a pro at this. It didn’t hurt that this was my third Niagara Marathon, and I had a sense of deja vu when passing certain landmarks. Here was where the sun came out from behind the cloud last year, and there was where my playlist switched to Britney Spears’ “Gimme More” when I ran it in 2008. Just before mile 25, the course took one of its few turns to go over a (small, not steep) bridge and past some cheerleaders – and they gave a huge cheer at the grin on my face. I had almost done it! For the final mile of the race, I listened exclusively to my two favorite running songs of the last year or so – Fun’s “Carry On” and “Some Nights.” I know I’ve written about this so very many times before, but “Some Nights” just makes me think of my friends and how wonderful they all are – I am so lucky to have gotten to see so many of them in my marathon travels! Marathons have introduced me to new friends all around the world, and they’ve helped me to stay in touch with old friends when I drop them a line that I’ll be coming to their city. I love how running can bring people together, both on the course and off, and that’s a huge reason why I run marathons. As I crossed the finish line, I heard the announcer not only calling my name, but also sharing that I had been the guest speaker and had been the youngest woman to run a marathon in all 50 states. I was so proud when he said that! I don’t really see myself setting any more records in running (most marathons?? No, thank you – I’d rather just have fun! ), but just knowing that I once set a record in marathon running makes me feel so proud and think about how far I’ve come. Some days I find it hard to believe that I’m a marathon runner, but other days, it’s hard to remember what it felt like to not be able to run a mile! Today was one of those days where it all just felt so natural and easy, and where I couldn’t imagine a life without running marathons. But at the same time, no matter how many I run, I’m reminded of how special every single race is… and how magical it is every time I get to cross a finish line. I rarely go for a PR, but I try every race to push myself in some way – to pick up the pace for a few miles, to not walk on a major hill, or just to run the whole thing with a positive attitude. Today I was really proud that I had been able to achieve such a fast time but have it feel so effortless – and it got me even more excited for how great NYC Marathon was going to feel, with the amazing crowds that help you forget your pain and really give it everything you have. After passing through the finish chute and collecting my special finisher’s hoodie (the organizers were trying this instead of a heat sheet, which was neat and different), I ran into Cortney, the organizer that I had been working with most closely. She told me that she had seen my mom earlier, and that my mom told her I was on track for a 4:02. But I had told my mom 4:05-4:15? It seemed to be fate that my mom had not only misread my email where I told her I’d finish between 4:05 and 4:15, but that she also accurately predicted my correct finish time. I’ll take it! Just one marathon left – and this one is going to be my glorious victory lap around my hometown. In case you couldn’t tell by the million times I mentioned it in this recap, I can’t wait. Anyone out there running it as well? Congrats on an awesome 99th! 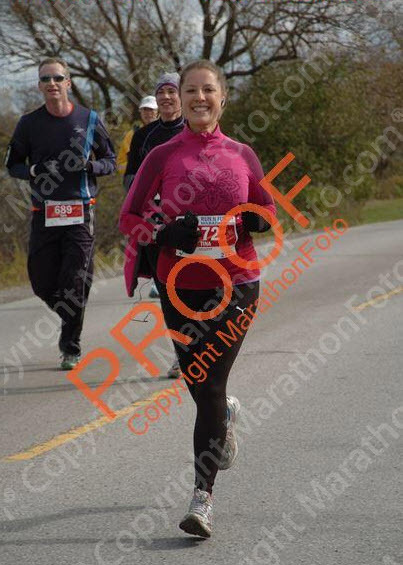 Great time too, top 25% of ALL your marathons (which is LOT LOL). Have a great time in NYC this weekend I will be there cheering! Hi! I’ve been reading your blog for awhile, and I just wanted to say thank you for this joyful marathon recap! I’m a New Yorker via Dallas, and I’m running NYC next week! It’s my very first marathon. I am nervous, excited, terrified, and every other emotion possible, but I’m going to trying very hard to focus on the things you’ve mentioned here! So fun that you’re a New Yorker via Dallas, and I’m so excited to hear that you’re running NYC on Sunday!!! Best of luck and just have an absolute blast – New York City Marathon is my absolute favorite big marathon, and it’s going to be an incredible day.